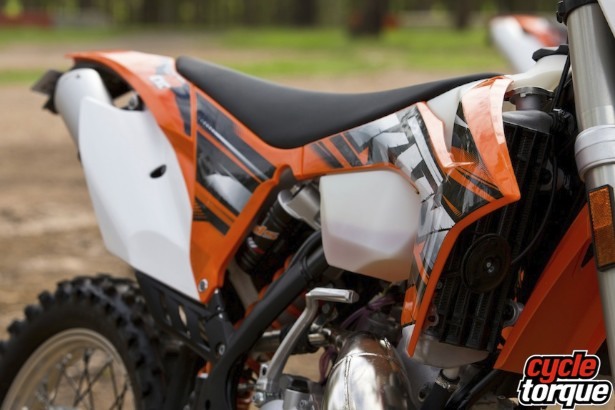 FOR the MX racer looking for something to slice through the bush, nothing comes closer to the feel, performance and razor-sharp handling of a motocross machine than a KTM 200EXC. With more capacity and performance than a 125 but with the extra weight and different gearing which comes with being a street-legal motorcycle, the 200EXC really can put bigger bikes to shame in the bush. On single track, the bike really shines. The screaming two-stroke punches hard when you make it wail, while the lightweight machine stops on the proverbial dime thanks to the powerful Brembo brakes, and getting the bike turned in the trees is child’s play. The engine’s been enhanced for 2013 with a new cylinder head, and it even features both electric and kick starters, standard. The features list of the 200 EXC reflects how this is an enduro bike with a motocross heritage. The WP suspension and PDS rear shock is very much the same as what you will find on the rest of the KTM EXC range, which offers superb handling and very wide range of adjustability to the rider. 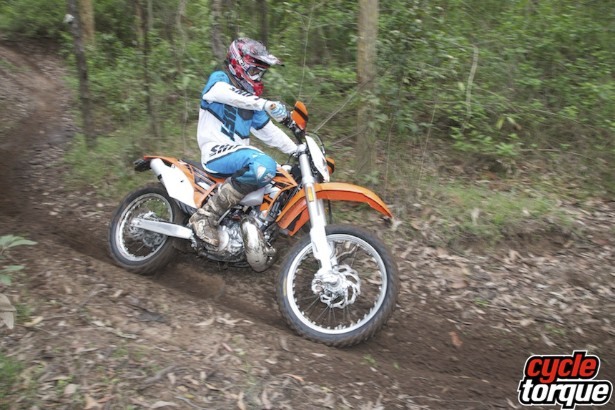 The Chromoly steel chassis is once again common across the EXC range, slightly tailored to suit each model, and has proved to be a strong, stable and comfortable set up for the entire KTM offroad fleet. The engine’s fed by a Keihin carburettor – with revised jetting for 2013 – and the six-speed box has ratios spaced for charging through the bush. The 200 is a delightful bike to ride on the single trail. The sharp handling characteristics make it a breeze to put the 200 wherever you want on the track. It handles well through the tight stuff, soaks up the bumps and holes, and dives in and out of ruts very easily. The suspension is set up well in stock form and even with standard suspension settings we weren’t really looking to move the clickers around or make any real changes. The Brembo brakes are well known to be some of the best performing brakes on the market, and the little 200 only magnifies the effect the Brembos have on this machine. They worked flawlessly for us every time. You can stop this thing on a dime. The 200cc engine is quite capable and offers great power considering it’s a small bore two-stroke. There is a nice mellow spread of power as you roll the throttle on, however turn it on a bit more and you’ll discover a lively and vibrant engine once the revs have picked up. Keep it on the pipe, beyond the mid range and up top, the revvy 200 will reward the rider with a very exciting ride. It’s considerably easy to keep the 200 in the meat of the power and high in the revs. As it’s a fast revving machine, it only takes a flick of the clutch with some aggressive input from the rider and before you know it the 200 is singing wide open through the trail. For a 200cc engine it’s quite fast and very potent in the hands of the right rider. If you often find yourself in tight bush where you don’t need lots power the 200 is a very attractive option. Where the gloss wears off is in the open, high speed areas, which is where the big-bore four-strokes area are at their best – but you’ll round them up again through the trees. The controls, levers and general seating position are very comfortable on the KTM. All the items in and around the cockpit are high quality and well functioning. The 9.5 litre fuel tank design also offers long range capability without sacrificing room around cockpit, which could quickly turn a light and flickable bike like this into something that feels more like a Russian Army tank. There’s a reason so many legendary off road bikes have been two-strokes, not least of which has been the incredible power to weight ratios they can achieve. Most of those legendary machines were infamous too, because they often handled somewhat entertainingly, frames twisting and buckling under the stresses. Not anymore. The oval-tube KTM steel frame is excellent, the PDS shock and WP USD forks responsive and controlled. Think back to bikes like Yamaha’s IT200 and how good a package they were for the average trail rider. Easy to maintain and lots of fun, without the over the top performance of bigger 2-strokes around 500cc. The 200 EXC is a modern version of such a bike, only much better. Every dirt bike rider should own one of these before they are too old to enjoy it. 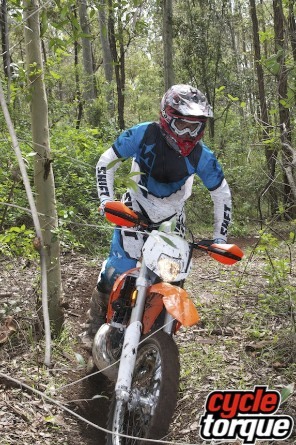 And at only $9999 – a run out price while stocks last – they are one of the best value for money enduro bikes on the market.